Shopventory tracks costs over time by "Lot"
A "Lot" is a batch of units that are received for a product of inventory. For instance, if I add a quantity of 12 units to one of my products, I have added a Lot that contains 12 units to that particular product. This means you can track changing costs easily and accurately. The Lot Cost is the cost entered for the latest shipment of inventory for this Variant. In other words, let's say I usually pay around 78 cents for my oatmeal raisin cookies; I can enter this as my Default Cost. But for my last order, I paid 77 cents. This number is set when creating or editing a product in the 'Inventory' section of Shopventory. This is the cost of the product that will be assumed whenever a new Lot (incoming quantity) of inventory is entered. This is also the cost Shopventory will fill into Purchase Orders when that product is added. In other words, this is what Shopventory assumes this Variant costs when you're receiving a shipment going forward. A "Lot" of inventory is defined as a group of units that arrived in a given shipment. For instance, a case of soda received in one shipment would constitute one Lot. Four cases of that same soda received in a subsequent shipment would constitute another Lot. The cost for each Lot of any product can change over time. A case of inventory purchased in January likely will not cost the same as a case of that same inventory purchased in June. Therefore each Lot received can be assigned its own cost and tracked over time. 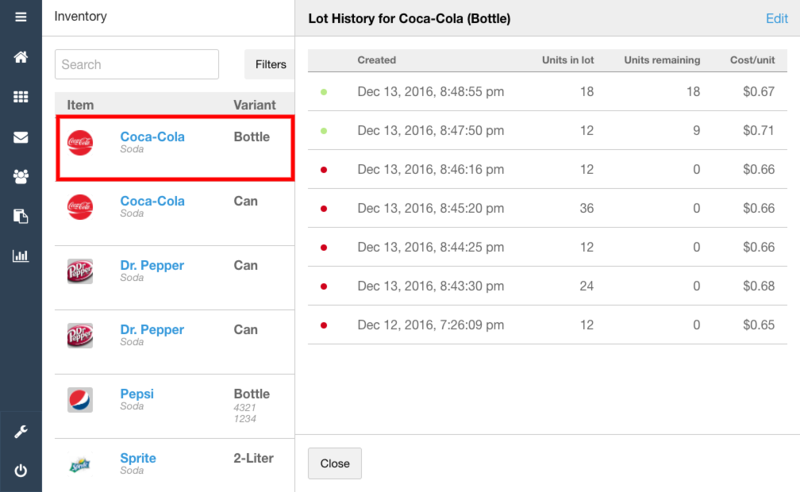 Lot history and lot costs are also factored into the sales reports and inventory reports in the Reports section of Shopventory. If you find that you have a large number of of empty Lot Costs to deal with, you can backfill all of them at once where current default costs exist. Note: A product without a quantity in stock cannot have a lot cost, since by definition there is no lot to which a cost can be applied. 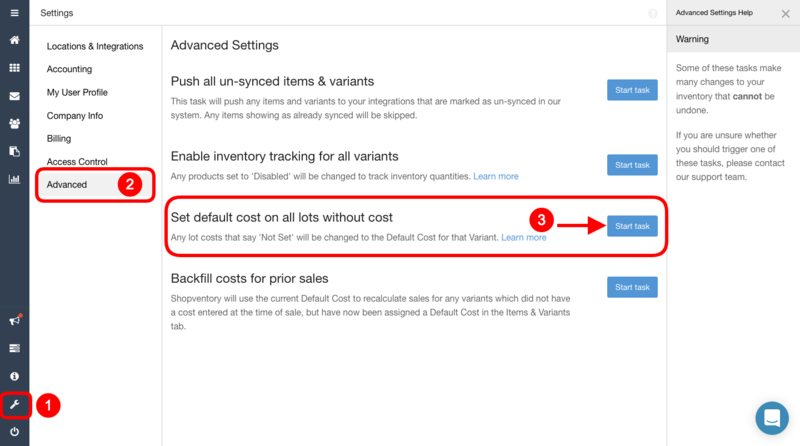 These products will say "Not Set" even if a default cost is in place. Add a quantity in order to add a Lot Cost. 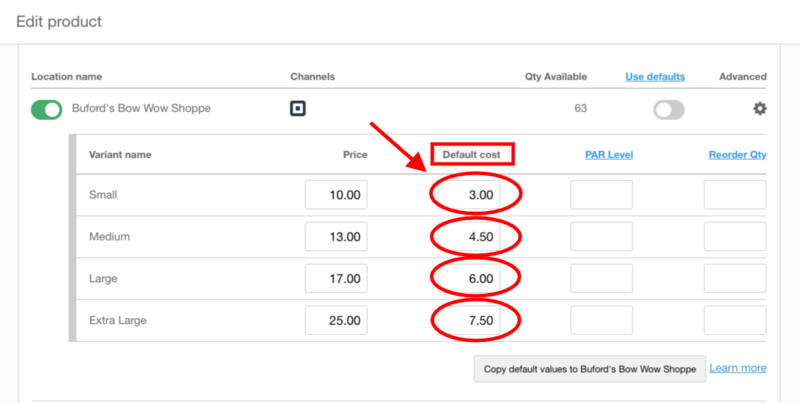 Profit is calculated using Lot Costs only, so if you see "not set" in a sales report, you'll need to go back and enter the lot cost associated with that particular sale (as shown above). The sales report will update accordingly once a value is entered.